A psychic FBI investigator comes out of retirement to track a serial killer with the power to see the future. After linking three unsolved murders to the same serial killer, FBI agents Joe Merriwether and Katherine Cowles take the case file to retired special investigator and psychic John Clancy. After much resistance, John reluctantly agrees to temporarily assist the investigation. An anonymous tip leads the investigators to an apartment where Victoria Raymond is found murdered in a bathtub. A note left at the scene shows that the killer accurately predicted the precise time the FBI would enter the apartment. Victoria’s husband David Raymond is arrested for the murder. While David is being interrogated, John’s psychic intuition tells him that David is innocent, although David hid the fact that he had just left his wife to pursue a relationship with a man and had contracted HIV. John and Katherine visit the parents of murdered boy Robert Ellis. Along with Joe, John and Katherine attend Robert’s autopsy. John receives a fax instructing him to tell the coroner where to look in the boy’s brain and they find a previously undiscovered brain tumor. John immediately quits the investigation. When asked for a reason, John tells Joe that the killer is a step ahead of them and leading everyone into a trap. Katherine tries appealing to John. John reveals that the killer is clairvoyant, and his ability to see the future makes him brilliantly dangerous. John also points out that the killer is acting as an angel of mercy, only murdering victims who are suffering or who will suffer horrible pain from terminal illnesses. Continually pressed by Katherine, John reveals intimate details about Katherine’s personal history to prove his power and satisfy her skepticism. The investigators are called to a murder inconsistent with the serial killer’s modus operandi. Investigating the serial killer’s possible connection to that crime leads to an encounter with a different murderer, Linus Harp. Harp shoots Joe, who later dies in the hospital. John and Katherine engage Harp in a car chase that ends in Harp’s death. Charles Ambrose tracks down John and confesses to being the killer while expressing a desire to finally meet the other psychic in person. Their confrontation ends with John trying to have Ambrose arrested, but the police instead take down John as Ambrose escapes. John confronts Ambrose again in the apartment of Ambrose’s next intended victim. The victim escapes. John follows Ambrose through the city and into the subway. Meanwhile, the FBI learns Ambrose’s identity and races to the scene. John and Ambrose confront each other at gunpoint in a subway car while snipers take position and civilians scatter. After mentally playing the outcome of their standoff several different ways, the confrontation ends when John moves to protect Katherine as she races into the car. John and Ambrose shoot each other. Ambrose dies and John is taken to the hospital. Recovering in the hospital, John makes peace with Katherine. John later recalls how he mercifully euthanized his dying daughter Emma as reconnects with his estranged wife Elizabeth. 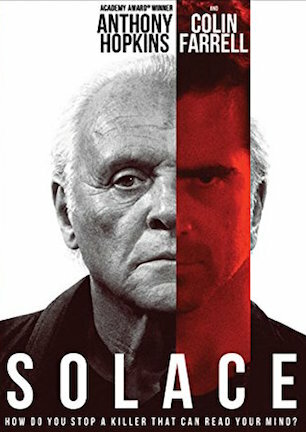 Somewhere inside “Solace” swirls the DNA of an intriguing serial killer chiller. To understand how a clever hook, a psychic detective pulled out of retirement to hunt a clairvoyant serial killer, and a top-tier cast, Anthony Hopkins and Colin Farrell star, ends up instead as merely mediocre calls for a little look into the 13-year saga of “Solace” going from spec script to “Se7en” sequel to dust collector to DVD dump virtually orphaned in North America. Fresh off the success of updating “Ocean’s Eleven” for Steven Soderbergh’s 2001 remake, screenwriter Ted Griffin sold a spec script in 2002 that New Line Cinema fitted for following up “Seven.” Commenting around the 10-year anniversary of his 1995 film, “Seven” director David Fincher reportedly said of the proposed sequel script, “it didn’t make a lot of sense to me. They wanted Morgan (Freeman) to have become clairvoyant in some way and that was the way he was now solving serial-killer cases! And I was like, ‘Well, that’s handy!’ (source: Movie Hole).” Back to the rewrite pile went “Solace” for additional input from James Vanderbilt and Peter Morgan before settling on a script officially credited to Sean Bailey and original scribe Griffin. Bringing a movie to market in this manner is akin to having Ray Bolger’s Scarecrow present a Fabergé egg to the tsar. Confidence that the heirloom will arrive undamaged is unlikely to be instilled when witnessing such a shoulder-shrugging parade of Marx Brothers movement. Yet given the talent involved in the tinkering, as acknowledged screenwriters had hands in “Zodiac,” “Amazing Spider-Man,” “Frost/Nixon,” and “The Shield,” it’s no wonder that “Solace” is rife with inventive ideas and creative concepts. By that same token of how it clumsily chugged from conception to completion, it is also no wonder that the final film ends up a pedestrian potboiler neutered perhaps by too many cooks changing directions in the kitchen. “Solace” starts salting itself with blandness straight away. The first frame is a dictionary definition, that frequently inessential way to open a movie on a yawn. White text on a black screen says that solace in noun form is “consolation in a time of sorrow, distress or sadness.” As a verb, solace is “to give alleviation, comfort, relief.” Whether or not the word is somehow assumed foreign to us, in no way does either meaning inspire one to stroke a chin, much less set up excitement for a suspense thriller. It doesn’t get any less beige. “Solace” marks the English-language debut of Brazilian director Afonso Poyart, who previously helmed one short and one feature in Portuguese. Producers perhaps misread his fit for this project or Poyart simply submerges his style until any and all fireworks and flair are visibly extinguished. Much of the filmmaking is mismatched or misguided. Hopkins’ precog flashes are nonsensical montages featuring ice cream cones falling in slow motion and wolves baring fangs without context. They are the kind of overly-cinematic insertions meant to be arty and ominous, yet are confusing and confused about their importance. A baby bottle shatters on pavement. A blurry Farrell waves his hands like Doug Henning. When these “clues” are at last identified in the climax, their unnecessary convolution comes off as even more comically confounded. Quiet kitchen conversations are shot with a handheld camera apparently ready to fall from the operator’s shoulder in an unpredictable direction. Dialogue scenes are unnecessarily hyperactive like this, yet a climactic car chase is shot so stereotypically as to be sterile of any energy. It’s as though Poyart is going through assumptive motions of textbook action-thriller creation without considering a signature making sense for a distinguished tone. “Solace” is like watching a checkers game played with chess pieces. To be less metaphorical about it, “Solace” is evidence of what happens when a roster stuffed top to bottom by the incomparable casting expertise of Deborah Aquila and Tricia Wood is handcuffed to middling material with all avenues to anywhere interesting cut off by colorless direction. It’s a deep bench of supporting star power, all of it underused. Venerable actors including Kenny Johnson, Xander Berkeley, Sharon Lawrence, and Janine Turner all appear even though not one of them has more than a single scene. Hopkins is game to make a go of it, as are the others top billed, but seems pressed for ideas on how to punch up his presence when everything within sight is flavored vanilla. You get the clear sense that everyone isn’t so much caught up in a “bad” movie as they are one underneath their abilities. As a slightly supernatural extended episode of “Criminal Minds” featuring guest stars a network could never nab, “Solace” might make for must-see TV. As a multimillion-dollar feature intended for big screen entertainment, “Solace” is serviceably average. January 26, 2016 by Ian Sedensky.